There's a lot of these fine single shots that only need a replacement stock to keep 'em shooting. Indestructible polypropylene stock and forearm fit just like the factory original but include a rubber recoil pad plus sling swivel studs. Will not crack; completely unaffected by changes in humidity. Det er mye av disse fine enkelt skudd som bare trenger en erstatning aksje å Hold 'em skyting. Uslåelig polypropylen lager og underarmen passer akkurat som fabrikken opprinnelige men inkluderer en gummi rekyl pad pluss slynge swivel pigger. Vil ikke sprekke; helt upåvirket av endringer i fukt. Worst stock I've ever bought. Almost impossible to attach to gun receiver. Standard size sockets will not fit inside buttstock. Just what is says it is. Zero problem with installation proper tools are required:-) Softens kick. Lifetime stock. i bought this to replace the damaged factory wood stock on my NEF. Its proven to be OK. I haven't found a better replacement for the price. However, I wouldn't recommend it over the factory wood stock. Stock is OK, I guess, but not as shown. Sling swivels are NOT included, although they are shown in picture. I ordered by phone and the technical department told me that the swivels were one inch, so I also ordered a one inch sling. Now, I have to buy swivels separately which does not make me happy. 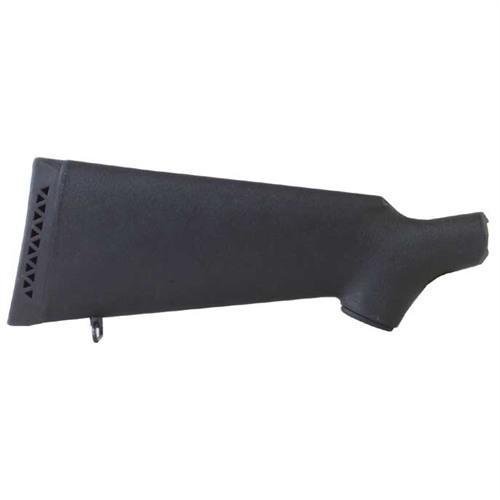 Fit well, and was a good replaced for the thumbhole factory stock. To make it easier for installing the stock, use a hacksaw to cut a slot in the head of the bolt that attaches the stock to the receiver. Then you can use a large screwdriver to tighten the bolt as a standard socket will not fit inside the stock. Nice stock but it doesn't fit a Mossberg 410 for which it specifies.